Patmos is one of the most beautiful and atmospheric of the Dodecanese Islands, a cluster of Greek islands off the Turkish coast in the eastern Mediterranean's Aegean Sea. Along its lacy coastline are many beaches and small bays, inviting you to explore it. Reached only by ferry, the island is off the beaten track. Patmos has history. Though it has an ancient Greek temple, Patmos attracts visitors from around the world as the place to which St. John was exiled for preaching the Christian faith in AD95. St. John sheltered in a cave where he had the visions written in the Bible’s Book of Revelations. You can visit his Grotto of the Apocalypse today. Byzantine emperors built and richly endowed the hill top Monastery of St. John. It possesses an important library and many other treasures besides its church, a place of pilgrimage, and massive fortified buildings towering above the unspoilt old town, Chora. (Chora is a name given to the principal town or village of a Greek island). 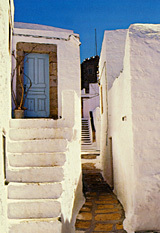 The narrow, car-free streets of Chora are characteristic of the Aegean islands. As you stroll through them, between whitewashed houses and stairways, you catch glimpses of breathtaking views over the island to the sea. You can experience this every day when you stay in the Chora house. Patmos' main town and port is Skala, a lively place with its shops, cafes, restaurants and nightlife. The beach house is nearby. Taxis are easy to find, and you can also rent cars, mopeds and bicycles. A bus service connects Chora with Skala and the other villages. A good road network allows visitors to take their own vehicle to many lovely beaches. Most have a taverna and on some, windsurfing, waterskiing and paddle canoes are available. Walking, though, is one of the joys of this island, especially in Spring when wild flowers abound. Boats take bathers for the day from Skala to the more remote beaches. Day boat trips can be taken to the small neighbouring islands. For travelling to / from the island, find out ways to get to Patmos.